1. CHIMA IS A COOL PLACE TO EAT: Chima is more than a meal, it is a Brazilian social ritual. Plus, it&apos;s got a cool atmosphere. Why not eat in a great looking place? The dramatic water and fire display greeted me and my CDC (cutie dining companion) before we passed under mammoth banyan trees and opened the door to the dining area. We were greeted by a welcoming staff and a soothing combination of mauve, charcoal, dark wood and steel interiors. 2. ENTERTAINMENT BEYOND THE GREAT FOOD: On the way to our table we saw the servers dressed in the traditional Brazilian gaucho pants, white dress shirts and boots. Instead of grazing in the pampas, however, they wander around Chima each carrying a long skewer of freshly grilled meat to serve guests rodizio style - meaning food is brought several times to the dining table. When we sat down at our table, we were immediately served a warm appetizer of small beef croquettes, parmesan yucca gluten-free popovers and a turkey spread. My CDC ordered a full-bodied Cabernet from hima&apos;s extensive wine and drink list. 3. SELECTION IS ENORMOUS; EVEN FOR VEGETARIANS: We were escorted to the truly stunning salad bar area. Over 40 items here would satisfy both vegetarians and meat eaters with dishes that include arugula and mushroom salad, cold smoked salmon, house vegetable soup, hearts of palm, gorgonzola mousse, corn mousse, endive salad, soy salad, a selection of dressings and sauces to put on a salad you make yourself, cheese assortments and freshly baked breads. Trays of sopressata, carpaccio and prosciutto are also on the oval table. If the salad bar would have been our dinner choice, hot salmon and swordfish with the choice of a pesto sauce or a spicy passion fruit sauce would also be included for just over $30. 4. MEAT CHEFS ARE ALSO MEAT SERVERS: Our charming and personable server explained the table discs to us, red side up means "Yes, please bring on the meat" and the black side means " We are taking a break." We flipped our discs over watched the food parade begin. The meat chefs came to our table and gave samples of what they have cooked and encouraged us to have as many as we wanted. The first gaucho offered us sirloin and asked if we liked it medium, rare or well, since depending on where he cut it, he could serve all three. The soft as butter slice was tender and succulent and a perfect partner for my velvety glass of Bodega Tamari Malbec. After that came an enhanced cajun sirloin and later a filet wrapped in bacon. Next, skewers of chicken followed by a mint basted lamb chop, sausages, and salmon and swordfish with a spicy passion fruit sauce and a pesto sauce. Had our stomachs allowed us, we could have had 15 different cuts of beef as well as the pork, chicken and fish choices. Some meats are more tender, some are juicier but all of them have something unique to offer. Gaucho chefs study for years learning how to properly grill and slice the meats. As the meat parade continued, so did the table side accoutrements of mashed potatoes, risotto and plantains which were unobtrusively replaced whenever one showed signs of indulgence. 5. DESSERTS: The temptation to stuff ourselves silly was strong but we managed to leave room for dessert. We were presented with an ipad that had both pictures, prices (around $10) and descriptions of desserts. We chose the hot chocolate lava cake with vanilla bean ice cream and a flaky warm apple pastry resting in hot caramel sauce. Both were delicious works of art to both see and taste. Chima is a good place to celebrate a birthday, an anniversary or a special accomplishment since it is relatively quiet even when a special dessert comes out to hallmark an event. Dessert was a perfect ending to a great meal. We lingered for a while after dessert watching the gauchos buzz around. Chima was a trifecta, theatrical, fun and delicious. 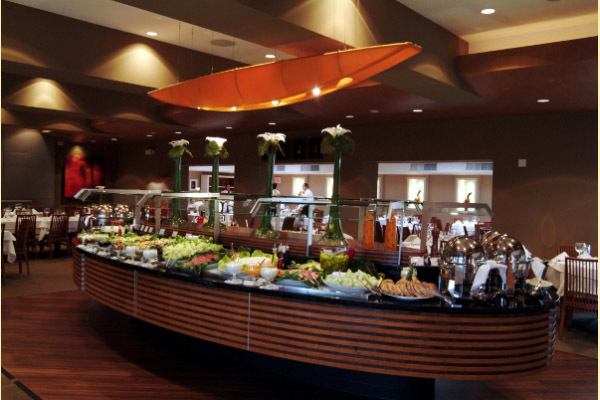 PRICES: Prix fixe of $52.50 for Rodizio table side service, $32.50 for salad bar plus hot salmon and swordfish. Prices do not include beverages or dessert. AMBIANCE: lively friendly, modern, cool, hushed.